NIFTY View Stock Picks PSU Banks - Should you invest? PSU Banks - Should you invest? Not all banks have announced their results for Q4FY17 as of now, so we’ll have a comparison for the 9 months ended 31st December, 2016 vs 31st December, 2015. Most banks have posted good growth in their revenue but the NPA issue has hit their profitability. The private banks continue to shine and outperform their PSU peers. Is the NPA issue behind us or further provisioning is on the cards that will hit the profitability going forward is the question. To what extent are the assets bad for these banks? The market has already discounted the bad assets in the PSU banks to quite an extent as these are trading at a deep discount to their book values. The private sector and institutional banks are going strong despite the NPA mess, that is why they trade at a high premium over their book values. 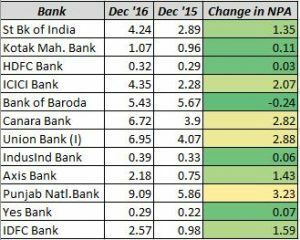 The below table gives the P/B ratio for those banks whose Gross NPA went up by more than 400 bps on a YoY basis as on 31st December, 2016. You can see the discount at which they are trading to their book value. Solely on the basis of these numbers concluding that they are undervalued could be a disaster for your portfolio. The Gross NPA figures are constantly on the rise. For the banks with Gross NPA more than 15%, just look at how the NPA’s have risen. These NPA’s could continue to rise and further dent the book value of the PSU banks. 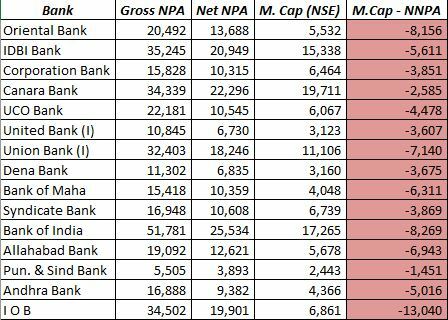 Let’s look at a list of banks whose Net NPA is bigger than their Market Capitalization. The point is that none of these banks are the reason for the all time highs in the Bank Nifty index. The private sector banks and banks like SBI, PNB have taken the Bank Nifty index to all time highs. We can expect these valuations to cool off. The earnings of the index will rise and some price correction can also be expected going forward. How has the Net NPA scene changed for the Bank Nifty constituents? Bank of Baroda has shown improvement while banks like yes, IndusInd and HDFC have seen a minuscule rise less than 10 bps. The Central Government has infused capital in the public sector banks and continues to infuse capital in tranches to have this system kicking again. As per the “Indradhanush” scheme of 2015, the Government had decided to infuse Rs 70,000 Crores into public sector banks over four years. Rs 25,000 Crores each in FY16 and FY17 and Rs 10,000 Crores each in FY18 and FY 19. This action meant that the banks would have to raise Rs 1.1 Lakh Crores to meet the Basel-III norms. This step of capital infusion is nothing but a bailout from the Government for the NPA mess that these banks had created. The Government has bailed them out on the condition that they will meet the capital requirements on their own in future and be prudent with their finances going forward. 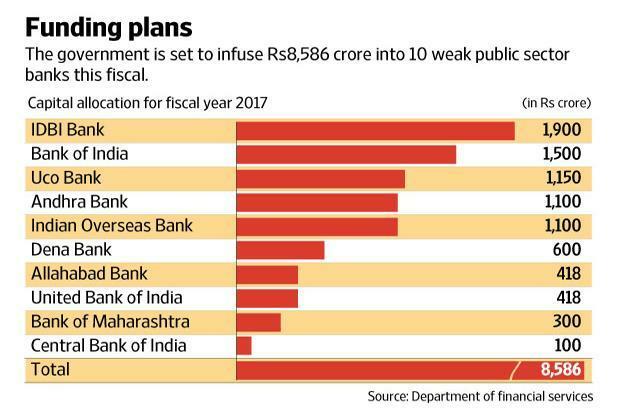 Though the PSU banks appear cheap on a Price to Book basis, it won’t be a wise decision to invest in these banks for the long term. The private sector banks are a better avenue to invest if you are bullish on the banking space. 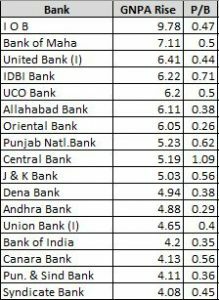 As written in our previous article Bank Nifty Valuations the private sector banks are nowhere expensive compared to their historical valuations. They have a better probability of compounding your investments than the PSU banks.